Selfridges offering BlackBerry Q10 this weekend | BlackBerry Blast! UK retailer Selfridges will have the BlackBerry Q10 in stock ahead of other retailers. 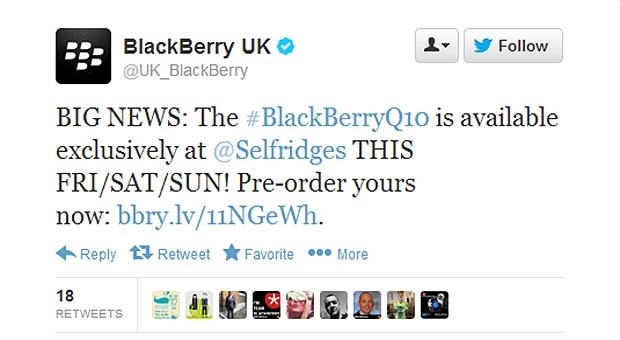 BlackBerry UK tweeted the news that Selfridges will start selling the Q10 this Friday thru Sunday for �580. They are already taking pre-orders so you can order a black BlackBerry Q10, or wait until Friday and take your chances by going down to the store. A lot of BlackBerry diehards are waiting for the Q10 because it has a QWERTY keyboard. We will know very soon what kind of traction BlackBerry has with BB10.